Auto finance sources went on the offensive during the third quarter, with loans made to credit-challenged customers representing just less than a quarter of new-vehicle loans during the period. And all signs point to auto lenders continuing to loosen their guidelines as consumers look to replace their aging vehicles. 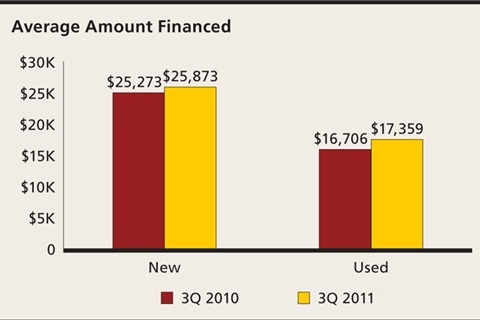 Fueling their confidence were car buyers, who continued to do a better job of paying their loans. 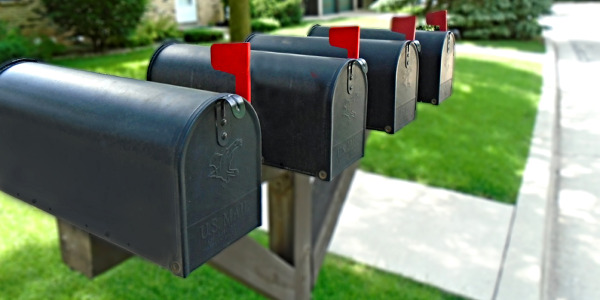 The ongoing drop in 30- and 60-day delinquencies continued to help drive down the total volume of at-risk loan amounts by nearly $3 billion. Also putting finance sources in a better mood was the fact that many of those risky 2007 and 2008 originations began coming off the books during the quarter. Industry observers might be nervous about higher volumes of loans made to high-risk car buyers, but the right level of managed risk would allow dealers to open up potential sales to a larger pool of customers. 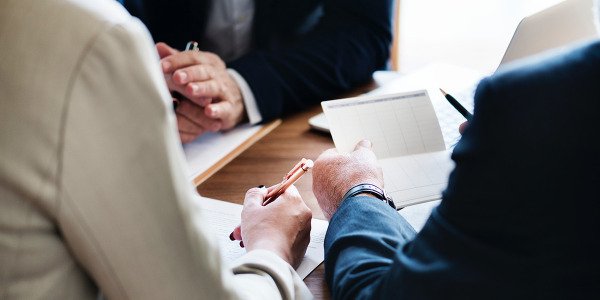 And as noted by finance executives during a panel discussion at the magazine’s annual conference in September, there is a higher concentration of subprime customers entering dealerships. Some insiders estimate that about 40 to 50 percent of potential car buyers still fall into the subprime category. Delinquency rates continue to serve as the bellwether of the industry’s health — the more they fall, the better the news is for lenders and dealers. 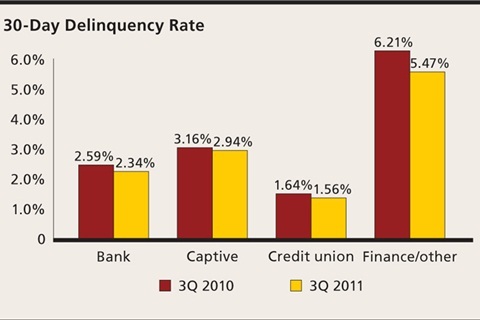 And during the third quarter of 2011, 30-day delinquencies dropped 7.05 percent year over year to 2.78 percent, while 60-day delinquencies dropped 7.4 percent to 0.71 percent. Those declines led to a $2.99 billion year-over-year drop in dollar volumes of at-risk loans, which stood at $18.159 billion in the third quarter. Another positive sign was the 6.4 percent year-over-year drop in repossession rates, which sat at 0.62 percent at the end of the quarter. 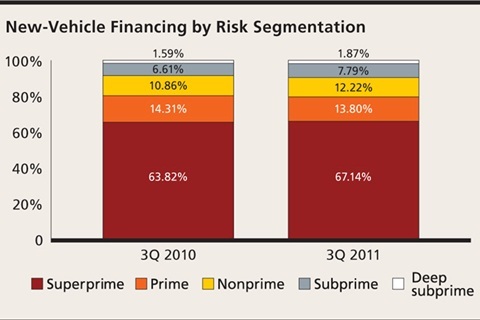 Lenders responded to improved repayment patterns, repossession rates and at-risk dollar volumes by taking on more risk during the reporting period, with all three below-prime tiers — nonprime, subprime and deep subprime — representing 21.87 percent of all new-vehicle loans originated during the quarter, a 14.8 percent increase from the year-ago period. The two highest risk segments realized the largest percentage increases in share. Deep subprime’s share jumped 17.3 percent, while subprime’s share increased by 17.8 percent. 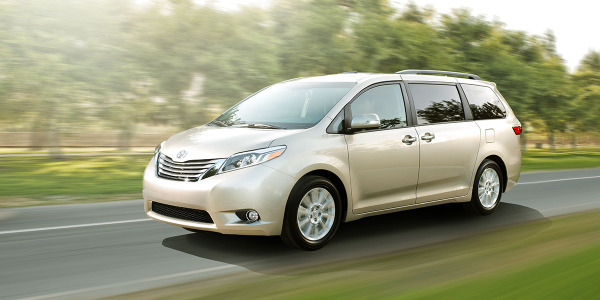 The share of nonprime, new-vehicle loans originated during the quarter increased by 12.5 percent. The increases in share among the high-risk tiers weren’t limited to one lending segment either. 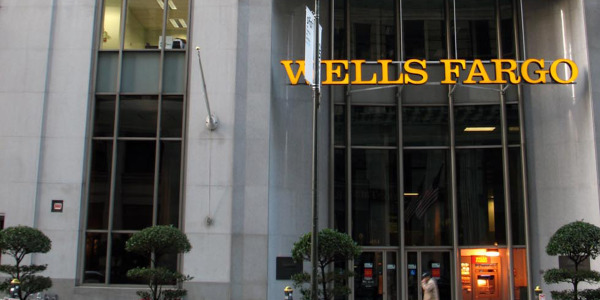 Banks increased their nonprime, subprime and deep-subprime originations by 20.8 percent, while captives, credit unions and finance companies increased their below-prime originations by 7.94, 5.25 and 2.98 percent, respectively. High-risk consumers weren’t the only car buyers to benefit from the improved auto finance picture, with the average amount financed increasing for all risk tiers. Overall, the average loan amount for new vehicles increased by exactly $600 to $25,873 during the quarter, while the average loan amount for used vehicles jumped $653 to $17,359. Examining the individual tiers, dollar values for new-vehicle loans made to nonprime customers increased 4.1 percent to $26,850, while values increase 6.4 percent for subprime customers to $25,527. Dollar values for loans made to deep-subprime customers jumped by 9.12 percent to $23,862 during the quarter. 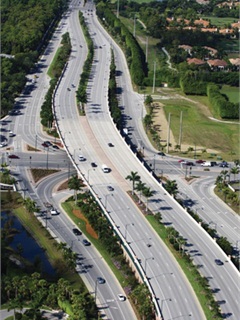 Another sign of the industry’s improved health was the performance of leasing during the quarter. 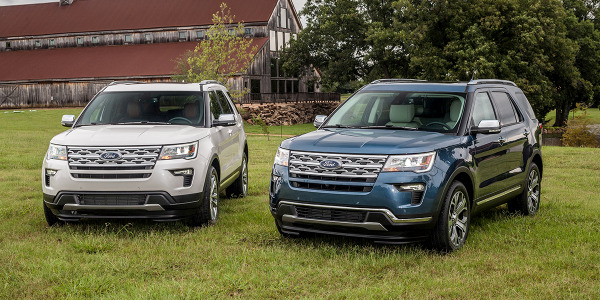 After a resurgence early last year, leasing captured 22.7 percent of the new automotive finance market during the third quarter. This was equal to the lease share recorded in the third quarter of 2010 and slightly higher than the 22.6 percent share recorded in 2007. 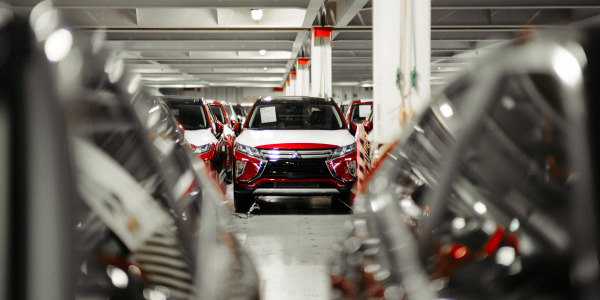 Leasing was on a downward trajectory after that year, with its share falling to 20.6 percent in the third quarter of 2008 before bottoming out in the third quarter of 2009 at 14.2 percent. 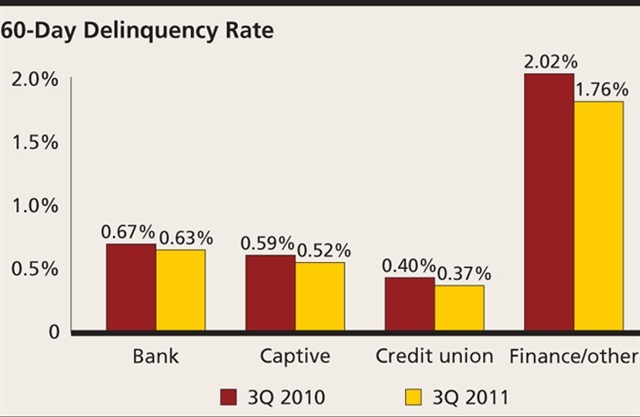 Looking at lease performance by finance source, Japanese captives led the way. 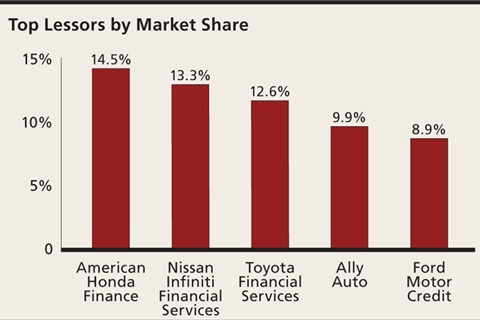 Honda Financial Services accounted for 14.5 percent of all leases, followed by the captives for Nissan and Infiniti at 13.3 percent and Toyota Financial Services at 12.6 percent. German manufacturers topped the charts in terms of their portfolio’s lease share. Leasing accounted for 65.26 and 62.4 percent of Mercedes-Benz Financial Services’ and BMW Financial Services’ portfolios, respectively. Additionally, leasing accounted for 57.41 percent of VW Credit’s portfolio. 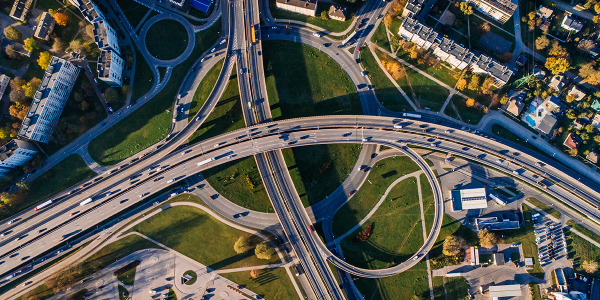 The continued downward trend for delinquent payments and dollars at risk, the availability of credit for riskier customers and a healthy leasing environment all combined to create near-term optimism for automotive lending. The key for success going forward rests with delinquencies and dollar volumes of at-risk loans. If those two data points take a turn for the worse, lenders will need to make immediate adjustments as to how much risk they can take. But, as heard at the magazine’s conference last year, several major finance sources are already talking about the possibility of making concessions this year if things like the unemployment picture don’t improve or worsen. 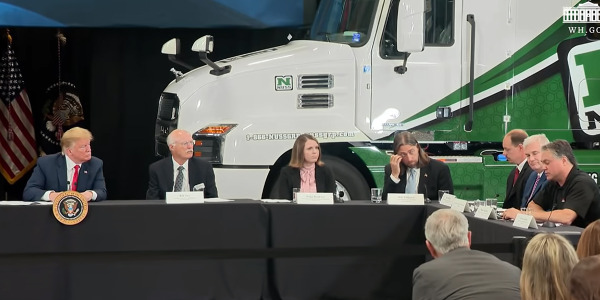 What they realize is that consumers will need to replace their current vehicles at some point, and they’ve made it clear they’re ready to make adjustments to capture the business.